Let's face it. We have all at some point pulled an all-nighter in Goa and struggled with hunger pangs that strike at an unearthly hour. Of course, 5 star hotels with 24x7 coffee shops are always an option, but they're frightfully expensive. So, we're showing you local food trucks and roadside carts that are open late into the night (how late? well, usually till about 4/5 am). With most of the major parties taking place in the Anjuna-Vagator belt, it is no surprise that there would be a food truck close by. Noronha’s at the Anjuna crossroads (the circle) is around till about 4am. Hard to be miss, this truck is parked there every night through the year, with the three brothers who run it, being around as well. Indulge your beef cravings here with their Beef Cutlet, Chilly Fry or Roast, or try their Spicy Goan Sausage Burger. And if you want a proper meal, their Chicken Cafreal Rasso with poi hits the right spot. Alankar Theatre Street in Mapusa City Centre is the go-to place for late night binges. The whole street comes alive only in the evenings, with different food stalls setting shop. You will mostly find Chinese food stalls here, but there are also Goan and Tandoori food stalls if that's your jam. And they have vendors serving just juices and milkshakes too. In fact, the street is buzzing and crowded till about 2am every night. A simple, unassuming place that serves the biggest, tastiest baguettes and wraps late into the night, Heera’s Maruti is a favourite among the party-goers! It’s a food truck that’s stationed near the starco junction at Anjuna, open till about 7am during season time or until 4am in the monsoons. Maruti — the chef and owner cooks with olive oil and the freshest of ingredients, whipping up delicious but inexpensive wraps and baguettes. The wholegrain bread as well as his trademark sauces are all homemade. 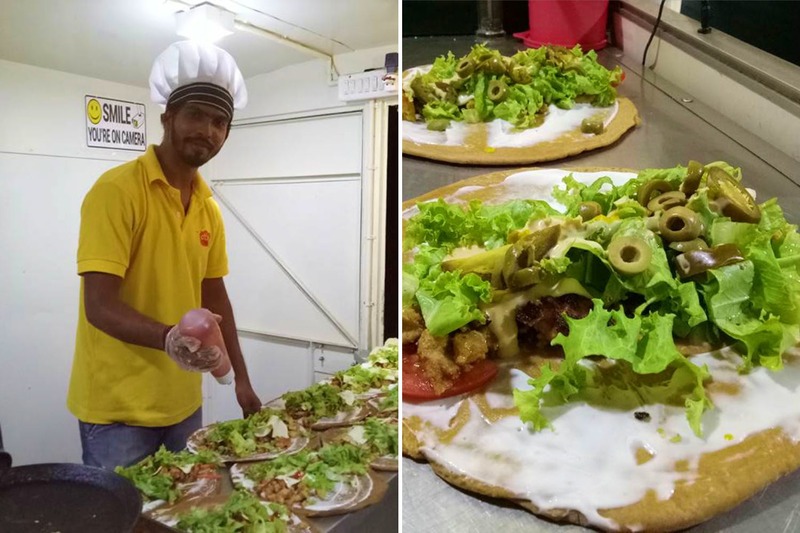 We recommend the monster chicken baguette — for the folks staying or partying in Anjuna, Heera’s is a must-visit! Ravi’s Ras Gaddo near the Panjim Church Square is another street food stall serving delicious food. The traditional Goan omelette poi here is garnished with rasso, usually from the Chicken Cafreal or Xacuti gravy. Ravi’s actually famous for his fluffy omelettes encased in a soft poi, topped with some raw onions and a large dollop of the ras. He is usually open till about 1.30am. Right at the junction where the Anjuna-Mapusa road branches off towards Mapusa and starts to go uphill (soon after Gunpowder and Astoria), on the right you spot this small cart run by Linda and her family. She serves local style burgers and gravies with the local poi bread — the portions are great for one person and quite cheap. From beef chilly fry, to pork cafreal to the basic chicken chilly — the dishes are delicious and homemade and come as single serving portions. Ranging between Rs 80 and Rs 120 per portion, we recommend the beef chilly fry, beef cutlet burger and her rose infused tea! Moreover, Linda and her daughters are the warmest bunch of people; the stall is open till about 2am, and she also does deliveries in the area for big orders. Located right opposite the AJ Supermarket in Anjuna, Ajuna Aunty is locally famous for her tea and ras omelettes. Her’s is a no frills stall that’s open from 6pm to 6am serving up delicious home made local food — from chicken thalis, to ras omelette the food is delicious and carries the touch of homeliness, a feeling that Aunty who runs the restaurant, also carries in her demeanour — catch her on a night when she’s chatty and she’ll tell you many stories though she’ll also make sure that you’ve finished the last of your food on your plate! If you’re there, make sure to ask for her special black tea infused with ginger.